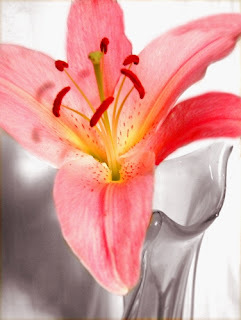 Lilium is a genus of herbaceous flowering plants growing from bulbs. Most species are native to the temperate northern hemisphere. They comprise a genus of about 110 species in the lily family (Liliaceae). 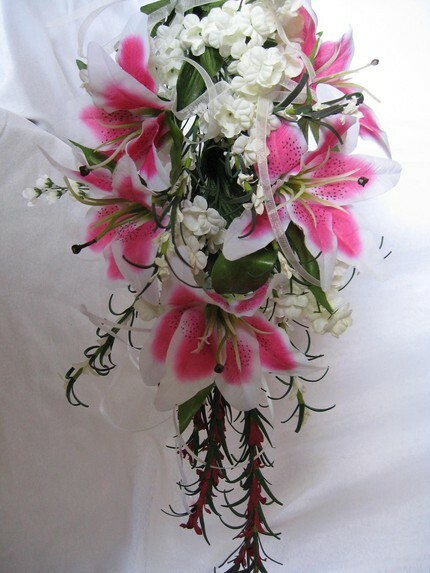 Lilium are important as large showy flowering garden plants. Additionally, they are important culturally and in literature in much of the world. Some species are sometimes grown or harvested for the edible bulbs. The species in this genus are the true lilies. Many other plants exist with "lily" in the common English name, some of which are quite unrelated to the true lilies. Lilies are leafy stemmed herbs. They form naked or tunic-less scaly underground bulbs which are their overwintering organs. In some North American species the base of the bulb develops into rhizomes, on which numerous small bulbs are found. Some speciesdevelop stolons. Most bulbs are deeply buried, but a few species form bulbs near the soil surface. Many species form stem-roots. With these, the bulb grows naturally at some depth in the soil, and each year the new stem puts out adventitious roots above the bulb as it emerges from the soil. These roots are in addition to the basal roots that develop at the base of the bulb. Most cool temperate species are dormant in winter, while some are dormant in dry summer and sprout with the autumun rain and need winter chilling to induce flowering the following year. Most species are deciduous, but a few species (Lilium candidum, Lilium catesbaei) bear a basal rosette of leaves during dormancy. Lilies' seeds ripen in late summer. They exhibit varying and sometimes complex germination patterns, many adapted to cool temperate climates. The large flowers have six tepals. They are often fragrant, and come in a range of colours ranging through whites, yellows, oranges, pinks, reds and purples. Markings include spots and brush strokes. The plants are late spring or summer flowering. The range of lilies extends across much of Europe, across most of Asia to Japan, south to the Nilgiri mountains in India, and to the Philippines. It also extend from southern Canada through much of the United States. Many species are widely grown in the garden in temperate and sub-tropical regions. Sometimes they may also be grown as potted plants. A large number of ornamental hybrids have been developed. They can be used in herbaceous borders, woodland and shrub plantings, and as a patio plant. 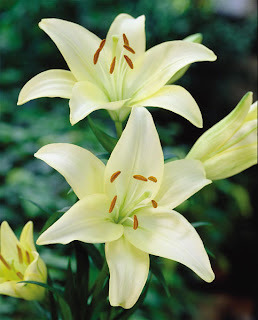 Some lilies, especially Lilium longiflorum, as well as a few other hybrids, form important cut flower crops. These tend to be forced for particular markets; for instance, L. longiflorum for the Easter trade, when it may be called the Easter lily. Lilium bulbs are starchy and edible as root vegetables, although bulbs of some species may be very bitter. The non-bitter bulbs of L. lancifolium, L. pumilum, and especially L. brownii (Chinese: 百合 干; pinyin: bǎihé gān) and Lilium davidii var unicolor cotton are grown at large scale in China as a luxury or health food, most often sold in dry form. They are eaten especially in the summer, for their perceived ability to reduce internal heat. They may be reconstituted and stir-fried, grated and used to thicken soup, or processed to extract starch. Their texture and taste draw comparison with the potato, although the individual bulb scales are much smaller. Copyright © Flowers . All Rights Reserved. New Thesis SEO V2 Theme by CB Design.